After scoring a whopping 106 goals in 38 Premier League games last season, the last place Man City seemingly need reinforcements is in attack. With Gabriel Jesus, Sergio Aguero, Leroy Sane, Raheem Sterling, David Silva and Bernardo Silva all producing the goods in the final third, Pep Guardiola appears to be well stocked in that department. While they also boasted the best defence in the Premier League last season too, that would suggest the midfield is the only area of the squad that could be looked at, particularly with Yaya Toure leaving this summer as his current contract is set to expire. However, according to The Sun, they have held further talks over a possible £60m deal to sign Riyad Mahrez from Leicester City, with the report noting that the Algerian international has emerged as Guardiola’s top summer transfer target. Whether or not discussions progress to a stage where a deal is reached remains to be seen, but it would appear as though Man City are keen on signing the winger this summer. Mahrez bagged 13 goals and 13 assists in 41 appearances in all competitions last season, as he returned to form and showed why City would be interested. Although Guardiola does have plenty of options in attack, as noted above, Mahrez could arguably offer a different dynamic in attack. While the likes of Sane and Sterling offer pace and width, the 27-year-old does possess great technical quality and creativity, and with David Silva set to turn 33 next year, he could be eyed as an eventual replacement for him. 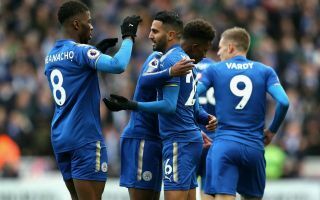 From Leicester’s perspective, it will be a blow to potentially lose a player who has been key for them over the past three years, but the reported £60m fee could help Claude Puel identify capable replacements.